We are going to craft a reproduction witch shoes as worn by actress Margaret Hamilton as the Wicked Witch of the West in MGM's hit musical film The Wizard of Oz. 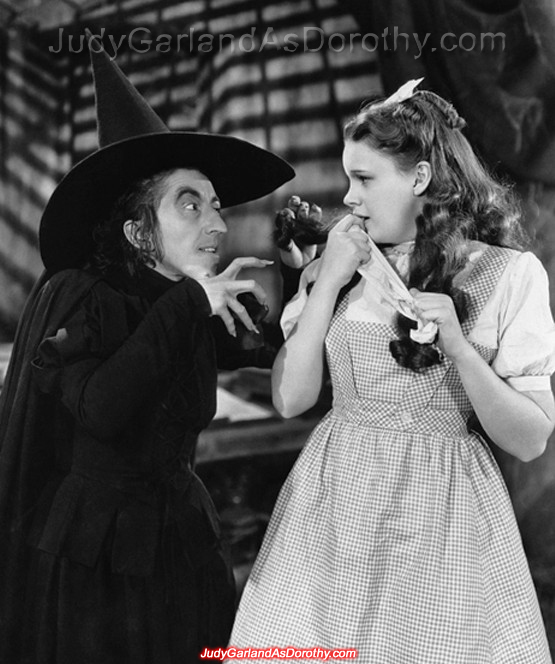 Margaret Hamilton was the same height as teen Judy Garland, and she wore the same size and style of shoes in the movie. 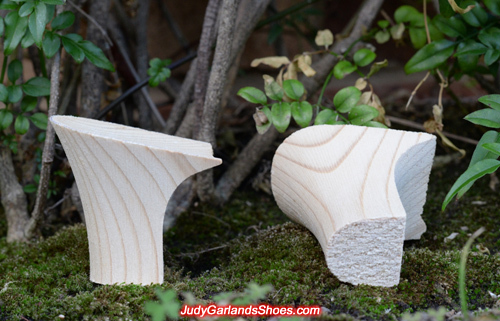 This is a pair of solid wooden shoe heels that we will be using on the witch shoes. These wooden heels are not available anywhere else. We carved the wood by hand to match the exact 1930's curve shape and height of the original wooden heels used by Innes Shoe Company to make the witch shoes. Leather heel caps will be nailed at the bottom of the heels. 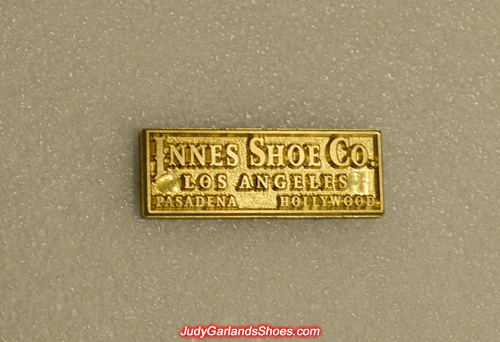 Vintage gold stamp block that will be used to create a heat embossed stamp in gold on the right leather insole of the witch shoes. This will give our high quality shoes an authentic look. The label will read "Innes Shoe Co., Los Angeles, Pasadena, Hollywood". This is our shoe mold, or lasts as they commonly known, in size 5B. This screencap is probably the best view of Margaret Hamilton as the Wicked Witch of the West wearing her black shoes in the entire movie. 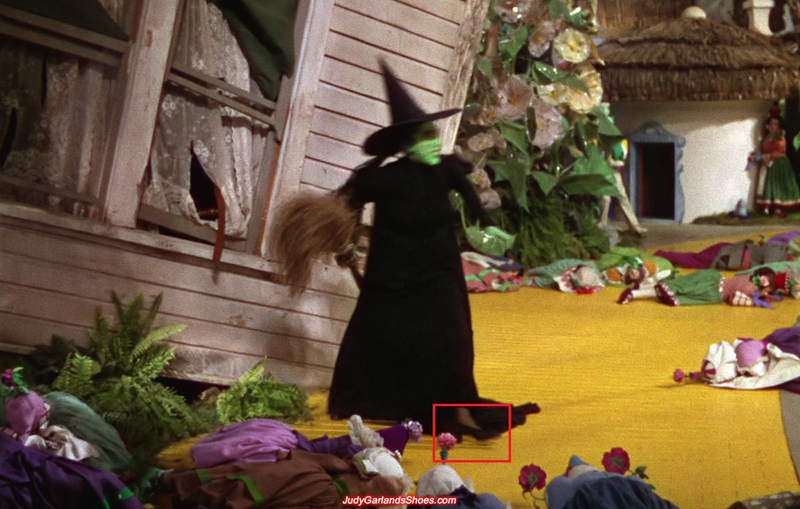 Even though it's not very clear, it shows the shape of the shoes from the heels, arch shank down to the pointy toes looking near identical to the shape of the ruby slippers that Judy Garland as Dorothy wore in the same Munchkinland scene. 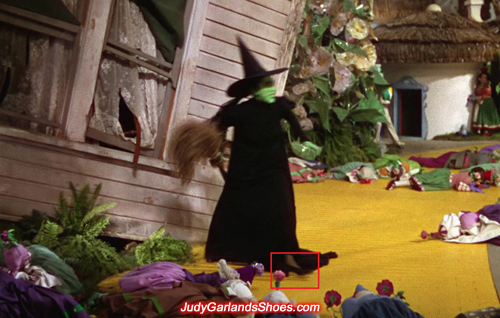 The original black silk shoes worn by Margaret Hamilton as the Wicked Witch was provided for use in the movie by Innes Shoe Co., the same manufacturer for the base shoes used on the original ruby slippers. Is this this first pair of black silk shoes which you have cobbled? What about the shoes of the Good Witch, have you made those? Yes, it's the first time that I am making them for a devoted fan of The Wizard of Oz. I haven't received any request to make the shoes worn by Billie Burke, who played Glinda, the Good Witch of the North. Do the black silk shoes have sequins? What kind of wood is the heel? Is there a bow on the black silk shoes? You'll see how the shoes look soon. Pictures of the finished product will be posted on the forum. You have great taste in actresses. For someone who considers himself "Miss Judy Garland's #1 Straight American Male Fan" please consider purchasing a pair of shoes from me and you'll get all the answers you want. Waiting with much anticipation for the unveiling of the black shoes. If someone does not love Miss Judy, then they have no taste in talent. You could buy a pair of ruby slippers, or black shoes, or both and display them in your home. These are beautiful pieces of reproduction Hollywood memorabilia worth owning regardless of your gender and sexual orientation. Most fans buy shoes for display purposes instead of wearing them, although when crafting any kind of shoes I make them in a wearable condition, but at the end of the day it's up to the person whether they want to wear them or display them. Miss Dorothy is very beautiful and multi-talented, there's no question about it. As a John Wayne American, a pair of woman's shoes on display would be difficult to explain. The incongruity would be immense. What about the Wizard? His shoes I could display. Any update on the progress of the black shoes? I always have admired your cobbling talent. Photos of the black silk shoes will be posted soon, thank you for your patience. The ruby slippers doesn't really represent women's shoes, but they represent a famous actress and movie. When your guests see your ruby slippers, they think you're a fan. It's just like a female fan displaying a replica Wizard shoes worn by a male actor from The Wizard of Oz. Will wait patiently for update. Am intrigued in the differences between the black shoes and the ruby red slippers. Deferred Gratification is that much sweeter. skepticism enough from my audience. will be a work of art.